It's the start of a new season when it comes to our approach on discipline in the Garrett household. Everyone who knows me is aware that I am a pretty relaxed parent. When I am honest with myself, consistency is really not my thing. I am horrible at sticking to my action plan. 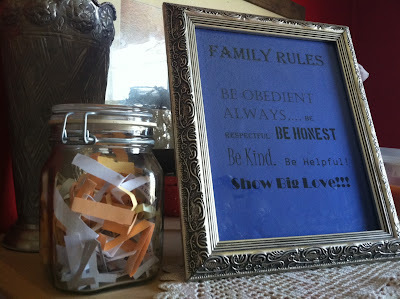 So this new plan is to help me and them know just what is expected and what will happen if they break the family rules. The inspiration for this plan of action came from two places. First was my children’s school where the behavior chart works very well with my children and the second was a parenting conference that was held at my church, NewSong Woodbine. Okay you heard me reference above that if you don’t follow the rules your clip will be pulled. This is pertaining to the new behavior chart that hangs in our kitchen. This is the part of the idea that works so well with my two older boys at school. Our family chart has 8 possible destinations for your clip to land depending on your behavior and choices. 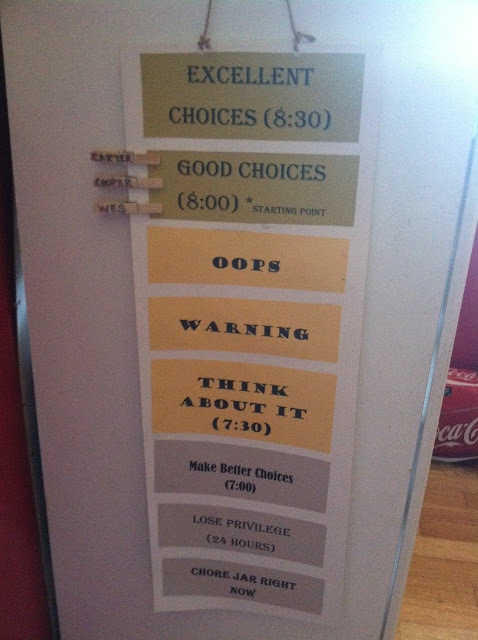 Everyday the boys clips(which are clothes pins) start on Good Choices. There is the possibility to move up and get the reward of an extra 30 minutes added to their day if they have gone above and beyond for that day. Good Choices and the starting point means that you have had a good day, and followed all the rules. However you don’t get rewarded for just doing what is expected of you and your bedtime stays at it’s normal time. Next on the chart is OOPS and WARNING these are mom’s forgiveness and grace and your two chances to get it right without disciplinary action, but you will be expected to have a little talk with at least one parent about your actions and why you did them. An apology will also be expected. THINK ABOUT IT is next you have broken the rules 3 times now and you will spend 30 minutes at the end of your day thinking about the rules you have broken. In other words you will go to bed 30 minutes early. MAKE BETTER CHOICES you have now broken the family rules 4 times and will lose an hour of your day to examine your heart. LOSE PRIVILEGE you have now broken the rules 5 times and will lose a privilege of parents choice for 24 hours. This could be ipad, TV, favorite toy, etc…. Last on the chart is CHORE JAR in this case you have now broken the rules 6 times and will have to draw a chore out to the chore jar and perform that chore as soon as you draw it. A special little note all previous disciplinary actions on the chart still apply if you get you clip pulled to another section of the chart. For example if you break the rules 6 times you do a chore, go to bed at 7:00pm, and still lose a privilege. Your clip can not move back up for the day once it has moved down. The good news each day is a new day and fresh start. There you have it folks a layout of the new plan in the Garrett household. I will let you know how well it works out for us. Happy Parenting!!!! Pretty cool James! Love it. I think this would work well for my 8 year old. Have to think how we could make it work with Sam (for those of you reading and don't know, Sam has autism) and his current therapy charts. Currently, Sam has a dry-erase chart with 4 boxes and a privilege at the end of the box row. If he gets 4 X's, he loses the privilege on that row for 24 hours. I really like this method though. Do you guys differentiate between things like willful disobedience (purposeful disobedience that is obvious) and maybe not as willful but still wrong behavior (such as being selfish or mean to a brother)? WOW, this might work well for Jazlyn too. I also need to incorporate it with her school behavior. We just found out Jaz has ADHD and is being medicated at the smallest dose, just to help her control herself. She can't sit still and blurts out ALOT at school. I'm gonna get some supplies and give this a try! @ Sarah yes we do differentiate some what. However all unexceptable behavior gets a clip pulled beacause it all breaks one of the family rules. If you get your clip pulled two times + in a row....there will be greater consequence. @ Stacey We incorporate school behavior in ours as well. If the boys come home with a card or color pulled at school they have to pull one at home for being disrespectful to their school/teachers/other students. This whole method has worked very well with us so far. Fingers Crossed! oh need this. I have a "complaining chart" right that on my fridge and its going well...but i like the clip idea and also the early bed time to think about what you did. Fantastic! Even the casual customers Tutu App would love the incredible applications they can download and install from check this site Tutu Helper. Below are several of the top functions TuTu Helpers of this extraordinary market. This design will last as much as 3 years bravesites.com/ much longer, and also is extra durable to Title chlorine in the water. This is especially Fleck 7000sxt Water Softener Ability Review valuable for heavily chlorinated city water products.Fleck Water Softener This version is a bit extra costly, yet it likewise has Best Fleck Water Softener the benefit of a setup package.